Caption: Bedouin man in Arab dress roasts coffee as it was done in the days before modern amenities. Here, he tosses coffee beans in the air as he roasts them over a fire. 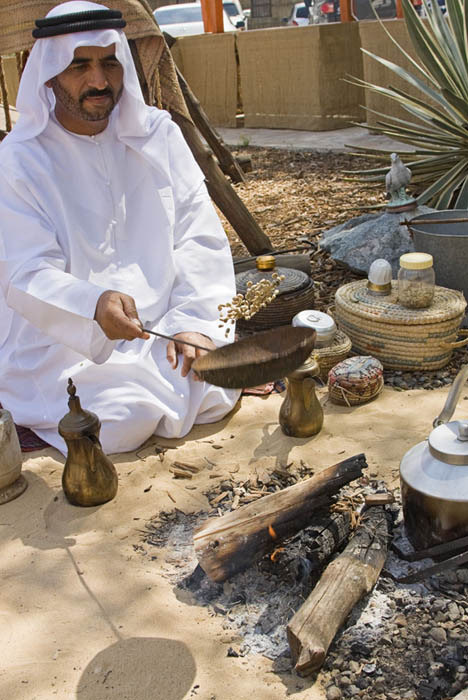 Comments: Bedouin Arab man in typical Arab dress shows how coffee was roasted in the days before modern amenities at a demonstration of bedouin life at Bastakiya, an historical area of Dubai restored with a number of art galleries, museums and cafes. Dubai, UAE. Here, he tosses coffee beans in the air as he roasts them over a fire.